Do not hesitate to contact us – we would love to answer all you questions. We are prepared to take 60 guests in total. Comfortable, comprehensively furnished single and double rooms with the possibility to add another single bed and 2 apartments and a Studio have the same, welcoming atmosphere. Some of the rooms have a view of the picturesque reservoir and Piękna Góra. The restaurant interior combines hunting trophies with a modern vibe. The air-conditioned room has very original lighting, a unique selection or wines and potted flowers. On sunny days, you can also dine outside. 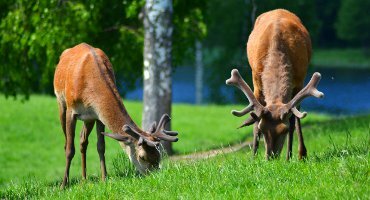 From May until the end of October, you can go on a bloodless safari at our enclosure for wild animals. This enclosure is located in the village of Zatyki, at the foot of Tatarska Góra and is called Rudziewicz Family Eco Farm. 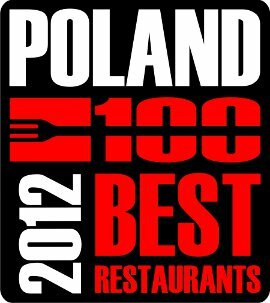 It is the only such café in the region – a café with a revolving floor situated on the peak of Piękna Góra. The view will surely captivate everyone, both during the day as well as after dusk. Take the fitness challenge and cross the ropes course located in the picturesque scenery of Piękna Góra. This facility offers you great fun with a dash of adrenaline and active relaxation in nature. One of the main attractions of Rudziewicz Inn is the bowling alley; it is equipped with two bowling tracks of 25.51 m. Bowling is an easy and pleasurable game and a popular sport. If you are looking for wonderful sights, interesting skiing trails in a relaxing region, come to Gołdap and stay at Rudziewicz Inn Piękna Góra. Here you will feel like in a fairy tale – and that’s not just thanks to the comfortable rooms and attentive service staff – but mainly this is the fairy-tale bathing area, Piękna Góra mountain that is rising to the sky, and the alleys planted with trees and flowers. And for those who no longer believe in fairy tales we have a physical challenge – bathing, a safari, angling, skiing, snowboard, and sledding. 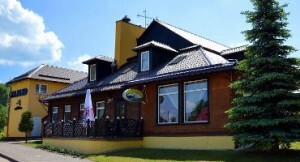 Rudziewicz Inn meets all of Organiser’s requirements for a three-star hotel. The interiors have been designed in the hunter’s lodge style and delight our guests, and the children often exclaim “What a great bear!” when they see the head of a wild boar. The facility includes a restaurant with a drinks bar, a conference room, a patio, single and double rooms and suites. The rooms are furnished with wool carpeting; all have bathrooms are en-suite and include a shower and a WC; in each room there is satellite TV, a telephone, wireless internet, and a fridge. Some of the rooms also offer a beautiful view of Piękna Góra and the picturesque reservoir. It is also possible to add another bed in a double room. We also welcome pets, for an additional fee. The restaurant specialises in game dishes and they will appeal to your heart through your stomach. 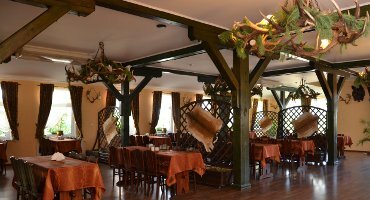 While you are staying at Rudziewicz Inn, don’t forget to try the delicious cepelinai, a local regional dish, which doesn’t taste quite as good anywhere else in Poland or in the world as it does here. Each year, in summer, there is a world cepelinai eating contest. “The goldfish”, that is the carps, catfish, tenches and other fish swimming in the restaurant’s fish tank, are waiting for you. Our guests can select the fish they want to see on their plate. The chef will clean and prepare it according to your wishes. We offer significant discounts for children. Our youngest guests can enjoy a children’s playroom and a special menu at the restaurant. This way we provide excellent fun for the children while the parents can spend some leisure time on their own. Undoubtedly, the greatest advantage of this facility is its very attractive location – at the foot of the mountain, Piękna Góra, and near the bathing area with two sandy beaches (one is located on the artificial island connected with the land by a wooden bridge). Here, you can relax to your heart’s content and spend those sweet moments relaxing in the sun. Our guests are welcomed to rent angling equipment. The fish you catch you can prepare yourself on the grill, smoke in the smoking room or give it to the chef to prepare it for you.